Visitors at Seoul’s airport can enjoy free musical performances and can make their own traditional crafts. Despite the recent ranting and threats by North Korean lunatic, Kim Jong Un, Alex and I flew through Incheon Airport near Seoul twice recently on our trip to Japan. 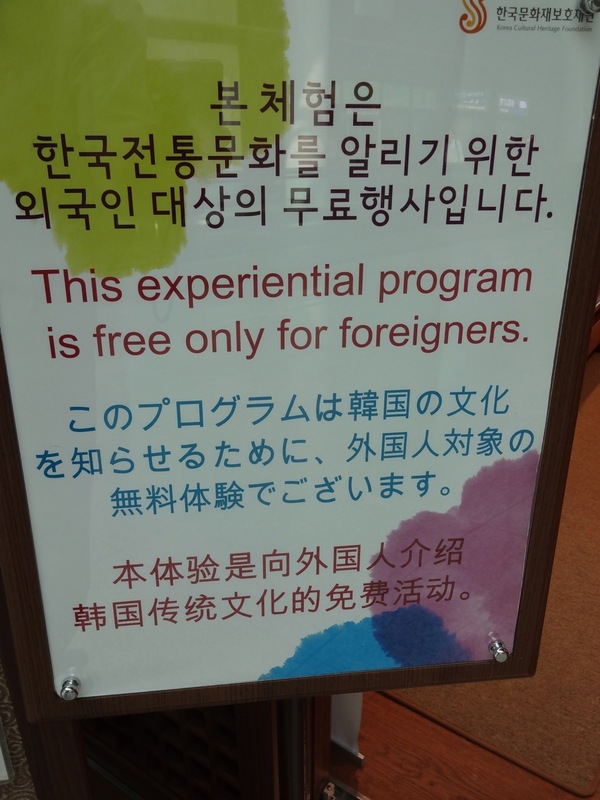 The airport in Seoul is one of the best in Asia and features not one but two Korean Traditional Cultural Experience Centers for visitors-at least visitors with foreign passports a sign informed us. Alex makes a wood block ink print at the airport in Seoul. Despite not obviously Korean, we were still ‘carded’ as we inquired about signing up for the free 20 minute Korean art classes. 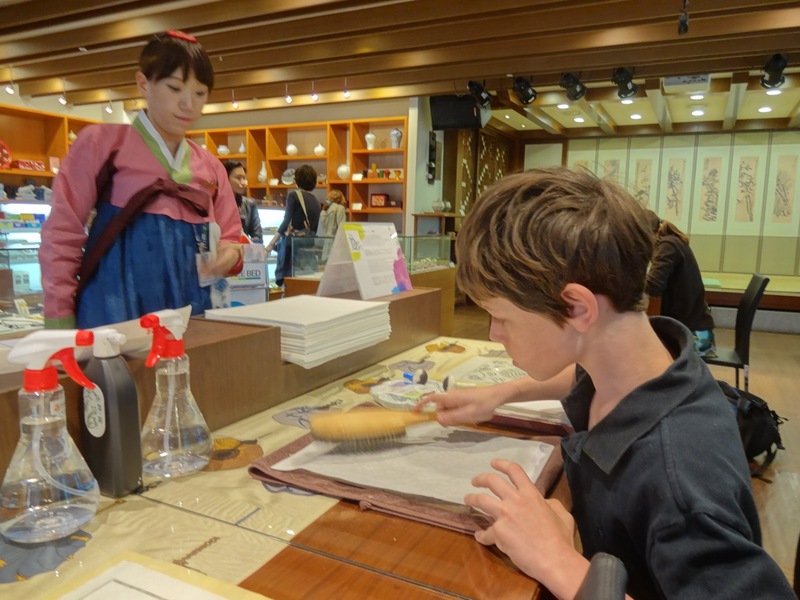 After showing our passports we were seated and given a quick overview of the traditional art of creating Korean block printing. Alex and I got to work on two different scenes, mine featuring a dragon, his an elaborate garden scene. As we created our prints, two young and beautiful Korean women performed traditional music on the small stage nearby. As promised, twenty minutes later we were on the way to our gate and our flight to Osaka. On the way back, Alex was disappointed that we had to change terminals and would end up far from the Korean Traditional Cultural Experience Center we enjoyed a week earlier. 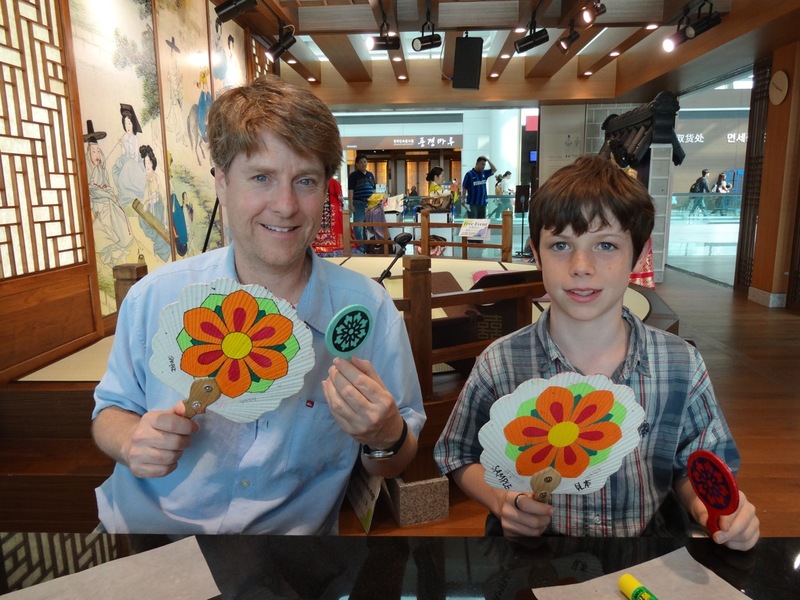 As we made our way to our plane back to China, we discovered yet another branch of the Korean Traditional Cultural Experience Center and one that featured new crafts to make and new musicians. This time we settled into making small hand mirrors with colorful designs. Like last time, we were wrapped up in less than a half hour and on way to the gate with more souvenirs. Alex and dad fan our still wet hand mirrors covered thin colored paper and shellacked to seal in the delicate paper.